Prices vary. Use the drop down to select your style, color and size. The price for the item you select will be shown. Click on the image and use the arrows to see styles. A - MOUNTAINEER ZIPPER FRONT LINED JACKET -- This jacket by Tri-Mountain has been crafted for quality, comfort and easy styling that adapts well to its wearer. The Mountaineer jacket is beautifully tailored with a shell constructed of water-resistant coated Toughlan Nylon. Stretch knit cuffs and waistband provide an extra comfortable custom fit. 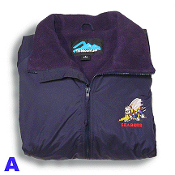 The anti-pilling fleece lining adds warmth and wicks away moisture. Double-stitched seams ensure strength and reinforcement where you need it the most. B - ULTRACLUB LINED HOODED JACKET -- Keep warm and dry with this water-resistant hooded athletic jackets. The outer shell is 100% Taslan nylon with a water-resistant coating woven into the fabric. The jersey lining is 85% polyester and 15% cotton for warmth and long wear. Hood and waist drawstrings with bell tips.